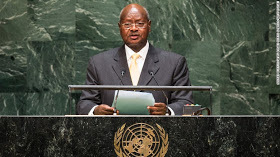 Following the controversial circumstances in the election process in Uganda, Uganda's election commission has declared incumbent President Yoweri Museveni, who has been in office since his rebel group seized power in 1986, the winner of the country's 2016 elections. He won with 60.7% of the votes while his closest competitor, opposition leader Kizza Besigye, had 35.3%, with a voter turnout of 63%. However, opposition leader Besigye was arrested and was put under "preventative arrest" at his home in Kampala on Friday, along with six officials from his party. Authorities detained the officials because they allegedly planned to announce unauthorized results tallied by the opposition. This is also not Besigye's first attempt to unseat his former boss. He lost presidential bids in 2001, 2006 and 2011.